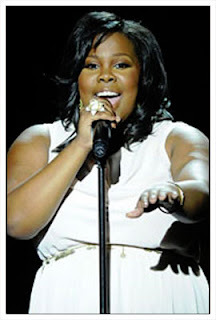 Vocal Pluses: Amber Riley has great breath control which allows her to hold notes for notable periods of time without issue. Her ability to support her voice with great technique means that these notes are sustained with no pitch deviation or lose of dynamic. She can also sing melisma and has the use of a quick vibrato. Vocal Negatives: Voice lacks agility, so complex vocal runs can sound clumsy and a little laboured. The voice also struggles with the lower notes and has an immature, childlike colouring to it at times. I was wondering if you've heard her perform Sweet Thing. If you haven't, I implore you to. I think it's more of Amber's style than anything she's done on Glee, she sounds great! Christina aguilera we love so much and we "Understand" all you have been through and we won't let mimi, Dion, Whitney and bey fans attack you cause we are "Fighter"s and we are gonna "Lift you up" and they "Can't Hold Us Down" cause we are "Beautiful". your voice was there from so, "I Will Be" there for you whenever you "Got Trouble"s so don't you ever feel "Underappreciated". and we can't live "Contigo En LaDistancia" and don't care what other people say about cause we are with and we well never give "Falsas Esperanzas". and we can hear your "Voice Within" our hearts and we can you in our "Reflection"s and we can't "Imagine" "what kind of a world would be Without You". and everybody knows that there "Ain't No Other Woman" like you. your is "Impossible" and it "Makes Me Wanna Pray" and say "WooHoo" everytime i hear you. so, don't ever "Walk Away" from us. i know this has nothing to do with amber it was a mistake sorry. Amber has a very great voice, it sounds very nice when she belts some notes. But, her voice lacks of agility, anyway, who needs to know it all about the strength and weaknesses of those singer's voice when we can't even sing like them and by the way, Amber looks very pretty when she smiles. Peace. i don't thinik this is right.. i mean it says that jojo has a better range than amber. no way!! The C6 she belts is not a chest voice , it's a mixed voice. No...JoJo probably has displayed a lot more of her range. Amber has not been given that ability to display her full range (if this is not it already). Her highest belt is a soprano C, so she may be able to hit higher in her head register. But I seriously doubt Amber's lower register extends farther down maybe a D3 at most. Despite the irritating childish flavour, her voice seems to be quite weighty to me, isn't she rather a lyric mezzo? Have you heard her "Try A Little Tenderness"? I was head over heels to hear a young girl, in TV series... rocking this classic like no one before. She sounds like a storm in this one! Her rendition of Whitney's "I Will Always Love You" was quite impressive as well, to me better than Miss Hudson. I love her voice , she's a great singer ! she reminds me of the old school singer - whitney , mariah , celine , etc . @Ocondro Amber rendition of "Try a Little Tenderness" was amazing! I love her singing Aretha Franklin's "Ain't No Way" too. I disagree with the description saying there is no weight to her voice. She has high notes but there is a real throaty edge to her too, despite her often childish coloring. ascend to a C6 in what sounds like the chest register alone." Maybe I need to clarify that line, but that is what i was alluding to. On the word "dance", which is the lowest note I heard on first listen, she hits an F#3. Where do you think she goes lower? Actually, I didn't watch the video. I made that comment on a friend's request, as we often argue about notes and stuff like that, and his musical ear is almost always off. I hope this clears things for him. I'm glad you answered!!!! If you want to belt properly the high notes you should really mix your head and chest voice, that's the best technique ever for singers ..
hey again, Amber Riley, surprisingly hit an E3, and belted a D6 in a Live Performance of JUMP! Clearly Amber has a better voice then Lea. I love Lea and her voice. But clearly there is note that Amber do that would be impossible for Lea. Amber has a raspy tone which sometimes sounds as if she struggles. But then again she don't. And I will always love you was better done by Riley then Hudson. Have she het some higher notes in here? Definitely seems like a soprano rather than a mezzo to me. Her voice is powerful, but not thick like mezzo-soprano voices. It is also light, very bright and agile, not smoky or dark. Her low notes are also much less developed than her higher notes (she has some muddiness around F3) and she gains resonance the higher she ascends into her head voice which is why her belts are so bright and strong. Definitely a soprano IMHO. Sorry the highest note she it in the performance was an A5. Which is missing in the vocal range video above. She doesn't. I've listened for like, ten seconds past that. it wasn't a particularly good run. she's done better runs, I don't see why you would point that one out, it's nothing special. actually, nevermind, I was confused when you said 0:27. That was a nice run, a very nice run. it doesn't really stick out from the nice runs I've heard, but it was nice nonetheless. Can i do a better run? Well, if my voice were as thin as Amber's, i would be able to. As it is, my voice is weighty (and deep, definitely) so runs are more difficult for me. In any case, what you said doesn't invalidate my point: that run WAS nothing special, it WAS the kind that Mariah or Christina do on a very, very bad day. Yeah, lighter voices are known for runs. That's why lyrics are known for ornamentation, they're just more agile. I think when Whitney's voice started deteriorating and becoming lighter, her voice actually became more agile, and her runs got better. It's been a long time since somebody has commented on this blog, but I'm wondering about her part in Getting Married Today in 4x14 (I Do)... what was her highest note there? She's just a note hitter. There's a plethora more to singing than just hitting mere notes. Range seems to be her only attribute as a singer. Still, pretty decent voice though. I don't get it. If her range is F3 - C6 then why is it 2 octaves, 3 notes & a semitone? Shouldn't it be 2 octaves & 4 notes? Sorry if this seems like a dumb question I'm still not used to music notes and octaves. the most traffic for the past day and for the current month. However, there are numerous HCG recipes that exist, thanks to the thousands of people who've bravely undertaken this diet. home. Be sure to go with fresh bait, and stay away from the baits that are based on chicken or cat food.